In case you've somehow failed to hear this already, the summit of Mount Diablo is one of the highest peaks around the Bay Area. (Only Mount Hamilton and a few peaks surrounding it are higher.) In fact, since Mount Diablo is a free-standing mountain rather than being "yet another peak" along a set of high ridges, it's probably justified to call it the "largest mountain in the Bay Area" despite the fact that its peak is not the highest. Moreover, for the same reason, it carves a much more imposing figure on the horizon from many points in the Bay Area. Wikipedia explains that a real estate promoter once hyped the view from the peak of this mountain as being the second greatest surface area that can be seen from any peak in the world. While that claim was not true, it's still impressive enough in having one of the largest "viewsheds" in the western United States. This probably qualifies more as a "mountain climb on a bike" rather than a typical mountain bike ride. My idea here was to do the closest thing possible to a "full climb" of the mountain (i.e., starting from as low an elevation as possible) by staying as far away from pavement as possible, and repeating as few trails as possible. 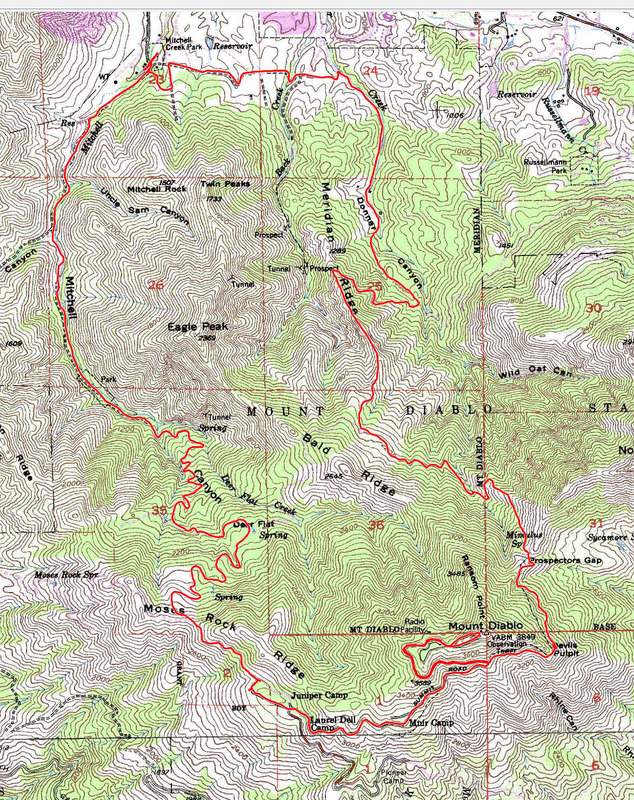 The result is a loop that has no repetition (other than the unavoidable final 0.9 paved miles to the peak) and is made up of three miles of road riding, "one whole mile" on singletrack, and the rest on fire roads. The surprising thing is that, despite not fitting the definition of an advanced mountain bike ride in any way that you'd imagine, the ride still takes more biking skill than you might ordinarily expect. An inexperienced rider doing this ride would be challenged by more than just the sheer amount of climbing. Not only does the short singletrack included in the route turn out to be of black-diamond difficulty, but there are plenty of very steep and loose segments in the first half of the downhill part of the ride that could easily get an inexperienced rider into trouble very quickly. Parking in the park is subject to a fee. This fee is $6 as of this writing. There is a self-pay station at the entrance from which this ride starts. You might want to bring exact change with you, and make sure you have a pen. The park opens at 8:00 AM and the Mitchell Canyon entrance does not have much in the way of parking opportunities outside the park. Not only is there a moderately long and narrow road (on which no parking is allowed) from the latest street-side parking opportunity to the park entrance, but even what street parking there is before that is in a residential area where the residents don't seem too friendly toward parking by park users. So, I wouldn't recommend that you plan to start this ride before the opening time of the park in the morning. The ride starts out on the gently climbing Mitchell Canyon Fire Road. You'll be strolling along this pleasantly wooded trail for a bit over two miles without any serious effort. The worst part of the climb starts quite suddenly right after that. The trail starts switchbacking up a steep hillside where the grade frequently reaches or exceeds 20%. On one particularly steep 0.4-mile stretch along this part of the trail, the average grade is 16%. This is a climb of the sort where you may see the slope slacken temporarily and gladly think to yourself "nice, this part is almost flat" and pedal a little easier, only to realize (if your bike computer has a grade display like mine) that this "almost flat" segment is still at a grade of 12%! The climb eases a little once you leave the first pack of tight switchbacks behind you, around the 3.5-mile mark from the beginning, as you turn toward Deer Flat. This easier part of the climb, adding up to just over a mile, averages about 8% grade. Unfortunately, it's followed by the steepest single stretch of the ride: The 0.2 miles with an average grade of 19.5%, immediately before the junction with Burma Road. Once you're past that, the worst of the climb is over. You shortly find yourself on pavement as you start pedaling through the Juniper Campground. At the other end of this campground, you connect to the paved Summit Road and continue all the way to the peak in the company of road cyclists. Most of this is a pleasant ride with gorgeous views. Unfortunately, the very end of the climb finishes with a bit of a slap in the face, where the last 0.2 miles or so of the climb that makes up the one-way driveway to the parking lot at the peak averages close to 16% grade once again. Once you reach the summit, you'll definitely want to spend some time in the visitor center, at least if this is your first time there. Not only are there informative exhibits there about the mountain, its history and ecology, as well as observation decks atop the building with views in every direction, but there is also ice cream, candy bars, granola bars, and soft drinks available here (downstairs), not to mention the fact that the actual physical peak of the mountain is exposed in one spot inside this particular building. So, you may want to bring a lock with you, unless you'll be okay with leaving your bike unlocked outside while you're in there. The last time I visited, there was also a fountain outside where you can refill your bottles as well (so, the water you bring with you at the beginning of the ride only needs to be enough for the climb). When you're ready to return, you'll be heading down pavement once again, but only for the 0.9 miles down to the hairpin curve named Devils Elbow. There, you get on the singletrack North Peak Trail. The general rule at Mount Diablo State Park is that bikes are legal only on fire roads. However, there are a few exceptions to this, and this short trail happens to be one of them. When I got on North Peak Trail, I got the distinct impression that this trail was designed for hiking, and bikes were allowed only after the fact, because the trail is very narrow, frequently steep, and punctuated with serious rocky obstacles. Of course, this also makes it an ideal bonus for many advanced riders. This is as technical as singletrack gets around the Bay Area. After North Peak Trail drops you onto Prospectors Gap and you start down Prospectors Gap Road, a different kind of riding challenge greets you. While this is a fire road, if there is such a thing as a treacherous fire road, then this must be it. At a number of sections, the grade is steeper than -30%, and the trail surface is covered with loose rocks on top of that. You'll find that your descent degenerates into a "controlled slide" at a few spots in this part of the ride. The striking steepness of this portion will also be apparent as you eyeball the elevation profile of the ride available above. The steep descent on Prospectors Gap Road ends after just under two miles and, in fact, this trail even has you pedaling uphill again for a very brief segment near the junction with a minor hiking trailed named Middle Trail. Once you get on Meridian Ridge Road, the descent resumes, although at a much less crazy rate. This section of the ride is actually quite cute with this trail following along the backbone of the knife's-edge Meridian Ridge for a little while. After Meridian Ridge Road takes a sharp right-hand curve and descends to its junction with Donner Canyon Road, your ride becomes a gentle stroll along the Donner Creek bed, and it's not long before you take a shortcut across wide open meadows to complete your loop and return to your car. The gentle climbing grades along this last stretch of the ride may feel as unwelcome as any steep climb earlier in the ride, when you are faced with them after nearly 4000 feet of climbing and as the temperatures may be ramping up (as it was in my case) if you do this ride at a warm time of the year. Possibly the least welcome of these is the uphill left turn you're forced to make just when you realize your car is only a few hundred feet ahead of you in a straight shot. Due to an older straight trail section being closed, you're forced to take this roundabout approach to the parking lot instead. As with any East Bay ride, you may want to save this ride to a cooler time of the year. Not only will the landscape be much prettier when, say, the grass is green, but heat could become a problem fairly easily if you make the mistake of attempting this ride on a hot day. If you can start early in the morning, you're more than likely to be done with the worst part of the partially shaded climb before it gets too hot, but there is little tree cover on the ride after the first time you reach pavement, and excessive heat can easily spoil your fun. For the same reason, you should take care to carry enough water with you to last the entire climb, if you do the ride in the hot season (even when you consider the fact that you can refill at the peak). On the other hand, you might also want to remember that the peak can often be very windy, which may be a bigger issue on cool days, so also make sure you have enough layers to wear.